Having spent over 35 years managing lawns and writing 2 books on gardening equipment I decided to put my favourite tools online. 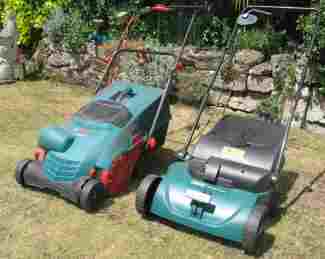 Lawn Edging - Shears versus Electric trimmers! Which Lawn Edging Shears are Best? If your lawn is well designed shears are the best option. Electric trimmers can be noisy, heavy, and create mess. They will cost you money to run and likely be thrown away in a few years. In comparison a quality pair of lawn shears are simple to use, more environmentally friendly and if looked after will last many years. Electric trimmers are more suited to large rough areas or people who don't want such a nice finish to their lawn. 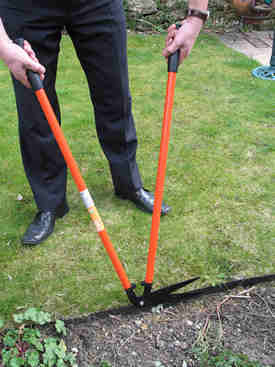 Lawn edging shears are simple tools that have been around for hundreds of years with few changes. 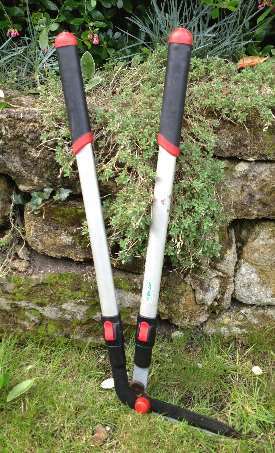 I have tested dozens of pairs and gave one of my coveted Golden Shed Awards to the German made aluminium handled CK Legend lawn edging shears. They had unique solid forged steel blades that put them in a class of their own. The quality of the blade and the adjusting mechanism made them self sharpening. I have used them for years and only give them a tickle with an oily rag now and again. Sadly this model was discontinued but has now been replaced with a new model with extending Aluminium handles which are handy and almost as light as my old favourites. The heavy duty version of my old model that has wooden handles is still available and will last your lifetime if treated well but costs over £80. The European made Bahco P75 shears set the standard for no frills, hard wearing lawn shears. 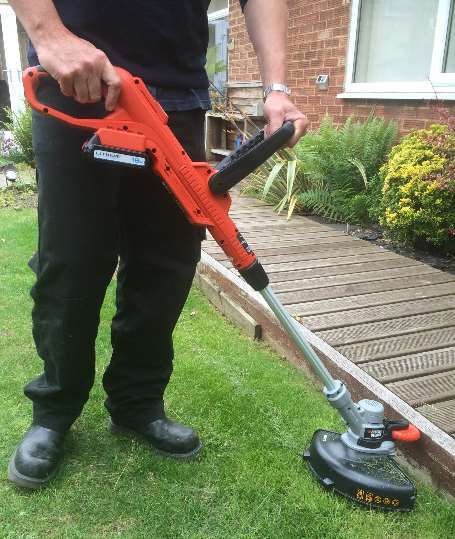 If you just want a really tough, no nonsense , good quality lawn edging shear then the Bahco P75 model is ideal. It is used by many professionals, tried and tested over decades. Handle length 90cm, Teflon coated blade for easy cleaning. 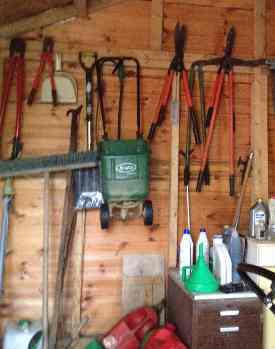 You will find Bahco shears in most professional gardeners sheds, along with an oily rag and sharpening stone! Using a good sharpening stone will save your tool and you a lot of effort! If your budget is a bit tight then the Wilkinson Sword lawn shears are worth considering. The Teflon coating is also nice if you like to keep your tools clean. Wilkinson Sword are now made in the far east and no longer the real top brand in gardening tools. You can still get cheaper shears but will probably end up buying rubbish. Full length to suit a six footer! This simple gadget clips to the side of your edging shears with its magnets and collects the grass. Saves hours of clear up work - ideal for perfectionists! Flat bladed, long handled shears are known as lawn shears ( rather than edging shears) and are ideal for cutting areas of lawn around trees and along the side of sheds and walls. 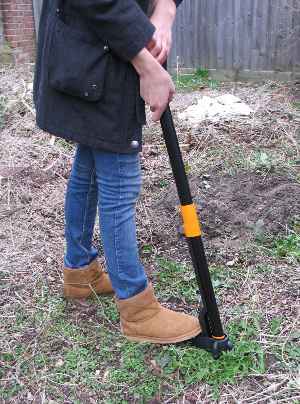 This type of tool is a great alternative to an electric grass trimmer for smaller areas and is much more pleasant to use. 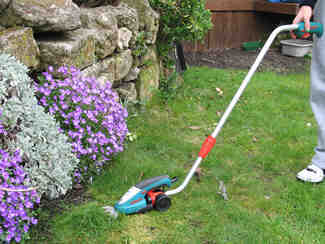 Electric grass trimmers - or "strimmers" as they are commonly known create a lot of mess for you to clear up. 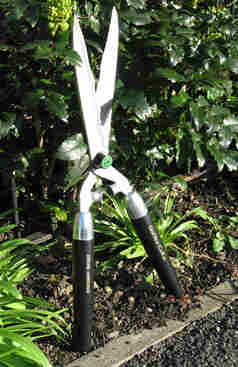 Lawn shears make little mess, last longer with little maintenance and make no noise! From my own long experience I can recommend the European made Bahco P 74 lawnshears. They have well made steel handles, are slightly longer than most others and have good quality blades. Bahco shears are used by many contractors as they are a no-frills well made and durable product. Unless you use your shears a lot they should not need much sharpening but running a stone over them occasionally is a good habit to adopt. DON'T USE YOUR HEDGE SHEARS ON GRASS! 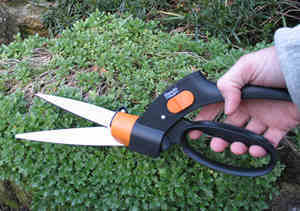 Shears like these are designed for cutting shrubs and hedges and not grass. 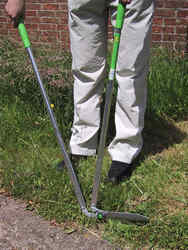 For small or fiddly areas of grass, single handed grass shears are ideal. There are many makes and models available but the majority are poor quality Chinese tools. If you want a small pair of shears for grass and soft foliage then these little ones below are the type to get. I tested this Fiskars Servo model and was impressed with its performance. The Wolf Garten model has been in production (and used by me) for over 20 years and the latest version has a grass deflector to keep the grass off your borders. The Wolf Professional shears have a neat grass collecting edge. 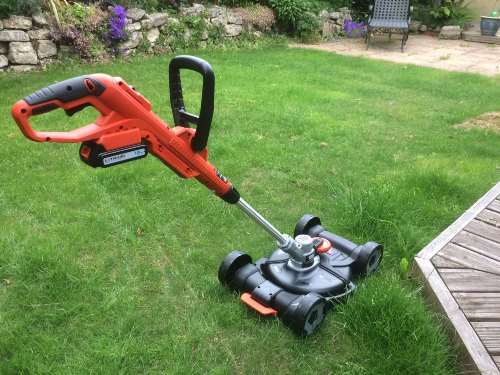 This superb cordless strimmer uses the standard nylon line in a spool to trim, and a slide-in 18v Lithium-Ion (Li-Ion) battery that holds 2 amp hours of charge. It can be recharged in 2 hours and gives a run time of around 20-30 minutes. A nice feature is the wheel that enables easy trimming of lawn edges. Just turn the tool on its side and run it along the edge. The handle has telescopic height adjustment with a good range and the line gives a 28cm cut. On the handle there is also an extra button to switch between eco and turbo mode. The idea is to gain extra battery time by using less power for lighter work. Does it work? Yes and it makes less mess on the lower setting if used on edges for a quick tidy. A unique accessory can transform the strimmer into a mini mower by attaching a small deck with wheels on. 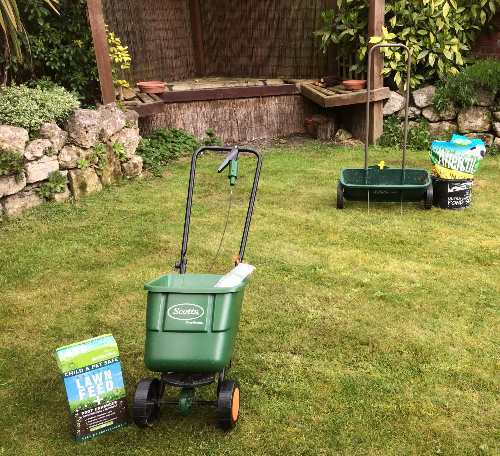 This was an idea I had years ago and was really chuffed to see it appear, and even more chuffed to try it and find that it is ideal for a quick tidy when my lawn occasionally grows in patches. I would like to make it absolutely clear that this will not replace a lawn mower on anything but the smallest lawn and even then you would have to keep the grass fairly short as the decking attachment is useless on long grass. The reason for this is that the deck prevents the grass from clearing so for long grass use the strimmer without the deck. I have used this product over 2 seasons and am pretty impressed, it also uses the easily available and cheap A6481 spool. WANT A CHEAPER MAINS VERSION? Many people have problems with Nylon cord line trimmers. The cords often break, fail to self feed or can be hard to replace or find replacement cord. For small trimming jobs I prefer an electric version of the sheep shear that has metal blades and is battery powered. This type of tool has been around a long time and is well tested. 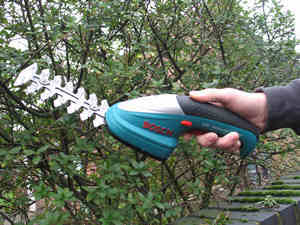 The Bosch Isio can be converted from a grass shear to a small shrub trimmer in seconds and is surprisingly efficient. Running time is very good thanks to the Li-ion batteries and I get 20 minutes use which included some woody shrub material. The softer the material you cut the longer the battery will last between re-charges. The Bosch Isio comes with 2 blades. The shrub cutting blade and the grass cutting blade. 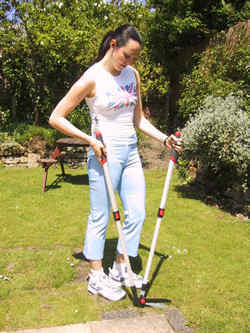 The telescopic handle is sold as an accessory and makes the Isio easier to use at lawn level. 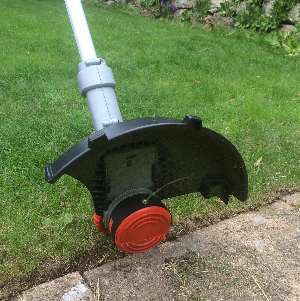 The handle has wheels built in for easy cutting on top of the lawn but this prevents the Isio from being turned on its side to cut vertical edges. You also get this blade for shrub trimming with the Isio, and the Von Haus version. 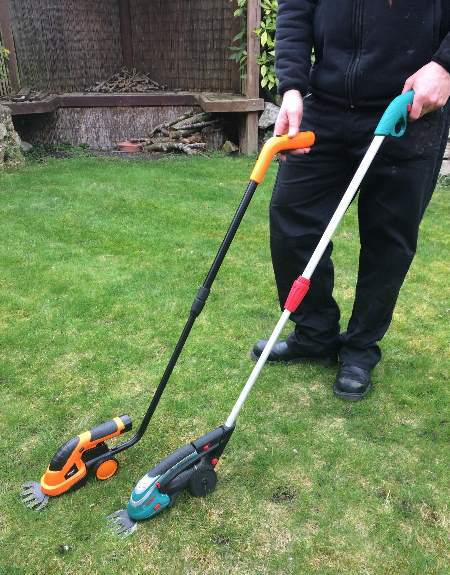 This bargain trimmer (orange & black) has all the features of the Isio but has a more powerful 7.2v battery. The blade is also wider than the Isio and the switch more comfortable. It comes with the extension handle and shrub cutting blade. WHO ARE VON HAUS ? 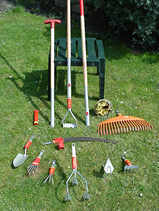 Von Haus is a UK based company that specify gardening and DIY tools to be made for them in various factories in China. In fact Bosch do this as well, especially with their cheaper products and those stocked by the big DIY chains. Von Haus make a similar tool to the Isio that is much cheaper but also better in many respects. The Von Haus trimmer has a 7.2v battery whilst Bosch only has 3.6v. This makes quite a difference in the time the trimmer will run and type of material it will trim. The battery can be removed and replaced which makes it more environmentally friendly in my opinion. For the money it looks excellent and in my initial tests is more effective and comfortable to use than the more expensive Bosch Isio. The Isio has a slightly longer telescopic handle which may be useful if you are 5' 10" or above. The Bulldog premier lawn edger - doing the Fredshed edges. The shank and head are one piece of steel. 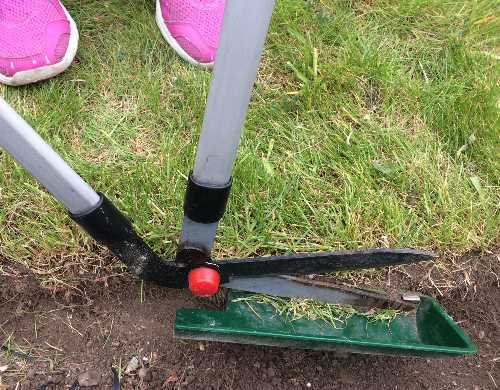 This essential tool is also known as an edging knife or edging iron and is the best thing to keep your lawn edges tidy and separate from bedding areas. This Bulldog model is the finest example of a half moon lawn knife available and the only one I know of where the blade is made from one piece of steel, forged by hand for maximum strength. The Bulldog Edging knife is made in Wigan and has been for nearly 100 years. 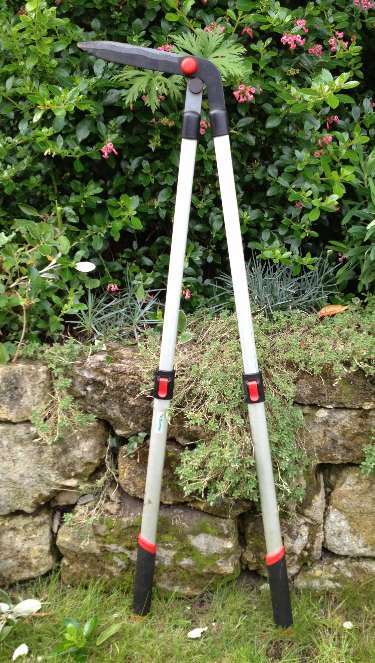 Most lawn edgers are made from 2 pieces of steel, welded together, which introduces a weakness in the tool. As users have a tendency to lever the soil away with the tool, strain is caused at the weld point and many become bent or broken. The Bulldog solid forged edger is hammered out from one piece of red hot steel and is actually strong enough to dig with. 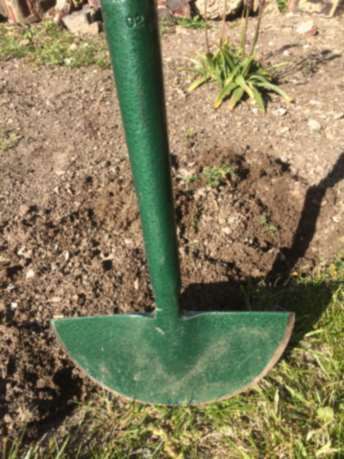 I don't recommend that you use it for digging but it wont bend if you lever soil away from the edge - unlike the cheaper types. It also has a solid ash shaft with a generous width T handle, and is painted in the traditional green colour of the Premier range. If you want a cheaper and lightweight alternative see the tool below. Whilst Stainless steel is not essential for this tool, a good quality stainless steel edging iron may produce a cleaner cut in wet conditions or if you have clay soil. If you want the best and the strongest, and don't mind paying more, then I would still recommend the Bulldog one. 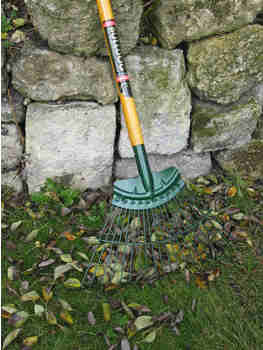 This is the finest example of a leaf rake available. The Bulldog springbok rake is a classic that has been used by professionals for many years. 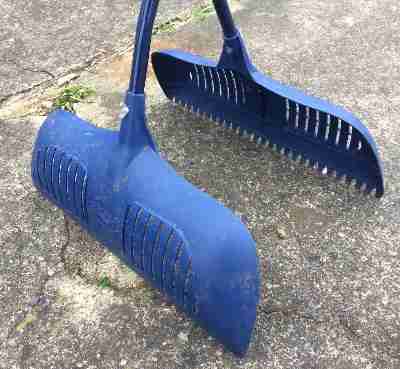 It is the best rake for use on grass and 100% made in Wigan UK. The reason that so many professionals use this rake is that it will outlast most other rakes and still keep its shape and flexibility. 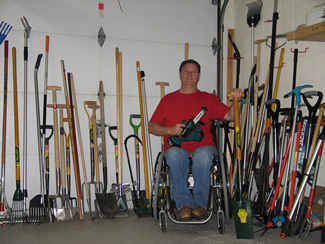 I have tried dozens of rakes over the last 17 years that I have been testing products for Fredshed. 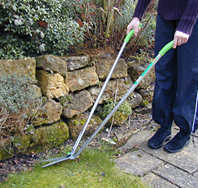 This Wolf plastic rake is one of the best as it is so light and effective and is widely used by professional gardeners. It is part of the Multi change system so you can save space and have many tools to fit on one handle. Although I personally don't like garden vacs I have tested quite a few mains electric ones and the best was the AL-KO Hurricane. It had a heavy 2400W motor and like most of these dual purpose tools was great at blowing but struggled to pick up wet leaves. Petrol models can have more power but I don't review petrol machinery on Fredshed due to the constant problems users have starting them and also maintaining the engines. The Black & Decker 36v battery powered cordless blower vac. picking up dry leaves and debris like cigarette butts from patios, decking and gravel. It wont pick up wet leaves well but this is the same for all garden vacs. This debris grabber is very popular with my test team as it saves them bending and is a joy to use. It is also very lightweight. The Spear & Jackson version is bigger, cheaper and has teeth for improved pickup. Great Tip To Save Time! 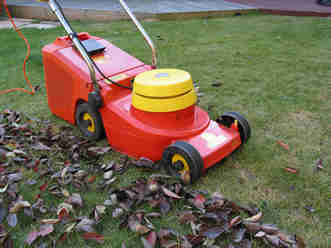 Use your mower to collect the leaves on the lawn in winter. Even if the lawn does not need cutting the mower will collect the leaves, beats raking any day! Bosch have recognised the benefit of using mowers to collect leaves and have designed a special blade for improved chopping and collecting for their larger Rotak mowers. A wide ash handle and plenty of boot space at the working end. One annoying thing about most lawn aerators is that they leave the extracted soil plugs on the ground. If you have a large lawn then it would be better to buy a powered aerator or get a specialist in who has one of these machines. If you are thinking of buying those silly spiked shoes then I would say don't waste your money. I suspect that they are also risky to use if you have any sort of weakness or problem with your ankles of lower legs. TOP TIP - USE LAWN AERATORS ONLY WHEN YOUR LAWN IS SOFT TO ALLOW SOIL PLUGS TO PUSH EASILY THROUGH THE TINES - ALSO SPRAY WD40 THROUGH THE HOLES BEFORE AND AFTER USE. At the moment the best lawn aerator I know of is made by Sneeboer of Holland. It has been personally designed by my friend Jaap Sneeboer so it will not clog up and each time you push it in the new plug will push out the previous one. 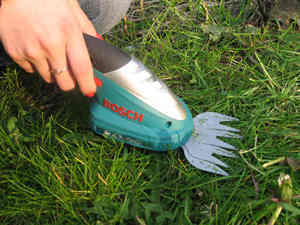 if your lawn is too wet or based on clay then the plugs may stick more and need poking out from the tool occasionally. Before purchasing a powered lawn raker I seriously recommend that you buy some lawn sand or Iron Sulphate to kill the moss first. 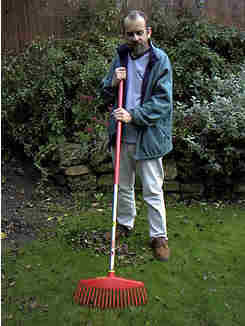 To keep your lawn well drained and cleared of "thatch" build up I recommend using a powered lawnraker. (also known as an electric scarifier). Doing this job by hand on anything other than small areas is for the super-fit, super-skint or totally insane! Sadly, like grass trimmers there are a lot of poorly designed and made lawn scarifiers out there. Here are some of the better ones I have tried and tested over the last 20 years. 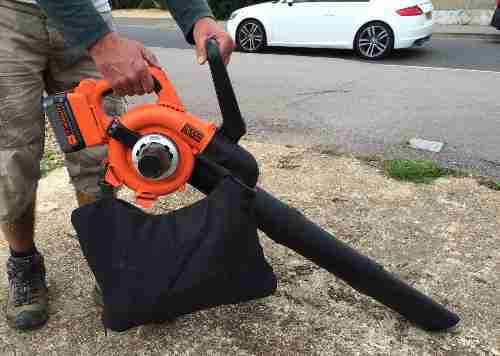 The Black and DeckerGD300 is a cheap and cheerful workhorse for lawnraking. It has a 600w motor. 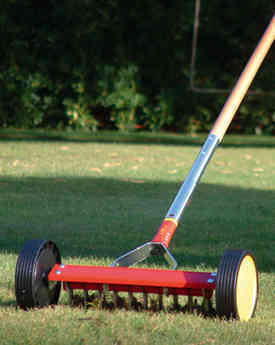 Bosch made a similar and slightly better built model called the AMR32F lawn raker. It has now been replaced by two 900w models. One has tines the other has metal blades that will rip your lawn apart. The Bosch ALR900 is the one with tines and the one to get if you want your lawn raked but not destroyed. The Flymo Compact 3400 is a great mid price scarifier and has also been around a long time with mostly very good reviews. I like iat £95 ish is a good deal with a 70w motor. TOP TIP - don't set blades too deep or use on hard dry lawns - this may burn out your motor! 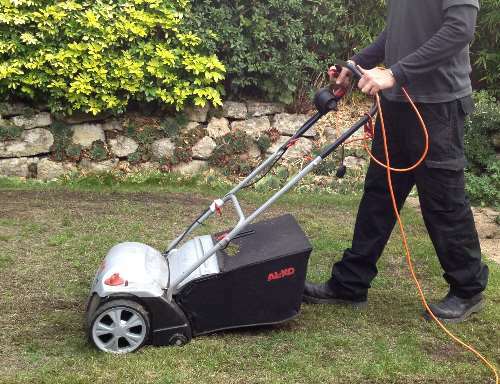 I currently use the AL-KO 1300W raker/scarifier which comes with 2 interchangeable cylinders, one with wire blades for raking and the other withfixed metal blades for deeper aerating. The Al-KO is extremely effective and is the model I have chosen to keep and use regularly. Tines may bend or break after a lot of use, especially if your lawn is too dry! 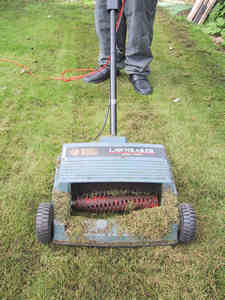 A thick mossy lawn is hard to cut and can strain the motor of your mower. 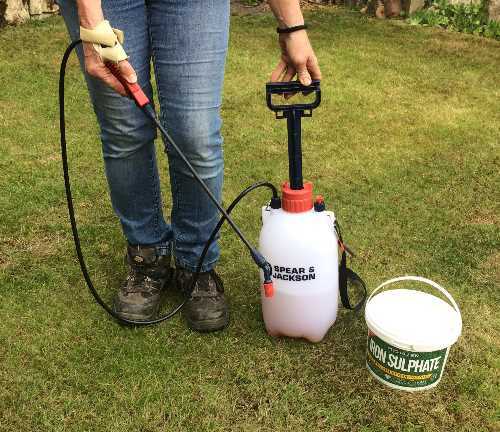 Many lawn treatment products are just cleverly packaged iron sulphate. Fred uses iron sulphate to kill his moss. Fred is smart - be like Fred and use iron sulphate to improve your mowing! If you have some spare energy or don't like electric scarifiers a good option is a manual one like this German made tool. Some years ago I owned its little brother that did not have wheels and I must say it was a devil to use. This new model Wolf URM3 rolling scarifier is more "vor sprung dork tecknic" and is much easier to use. For fitness fanatics and masochists everywhere this is the lawn tool for you! You will need to buy a separate handle for this tool and can use the link below. 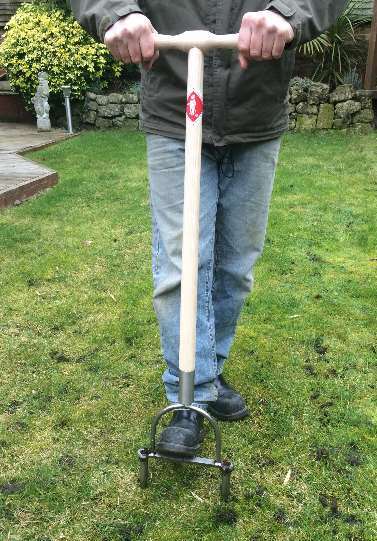 The good news is this handle can also fit a huge range of other garden tools too. It's wheely easy to use! - especially if you killed your moss with Lawn sand or Iron Sulphate first! 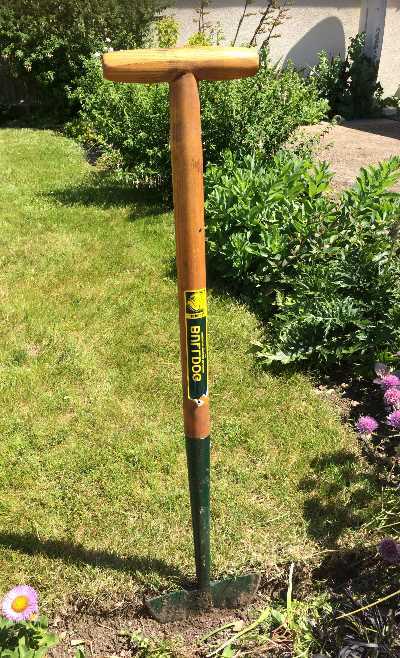 If you watch TV then you probably will have seen the advertisement for this new wonder tool to make weeding easier than ever. 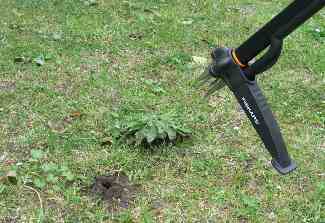 As part of my work I have been testing weeding gadgets over the last 20 years and have tried dozens of them. The important thing to realise about weed pulling gadgets is that there are many different types and sizes of weeds and none of the gadgets can cope with them all. Another reason for this is that weeds will be located in different soil types or even lawns. Compared to most of the ones I have tested I can say the Fiskars weed puller is pretty good at pulling out the larger weeds. It is made from very tough but light fibrecomp material and requires that you have reasonable eyesight and hand eye co-ordination so that you can locate the jaws of the tool around the weed. Once located you press down with your foot and lever the handle backwards to remove the weed. 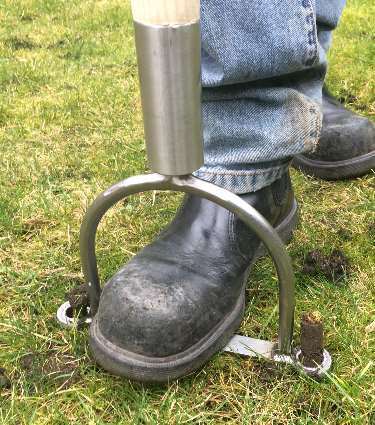 The tool is described as a lawn weed puller but I found it to equally useful on soil. 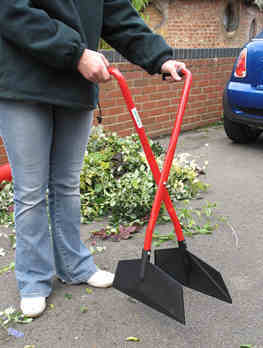 If you use it on your lawn remember that a large weed will leave a large hole so have some soil ready to fill the hole. It is great for the larger, deep rooted weeds.